Explaining why the game may put some of your ships into an inactive reserve. The next version of Airships, dev4, introduces "the reserve" as a concept. It's a bit confusing (and I'm a bit unhappy I had to introduce it), so here's an explanation of what and why it is. 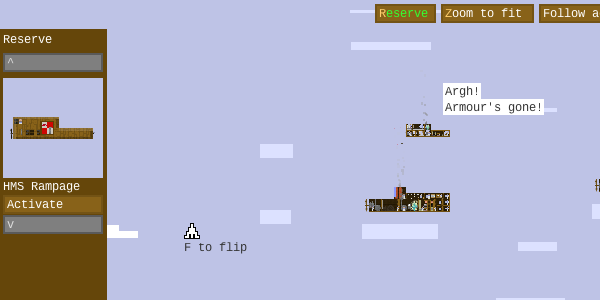 Airships in the game are placed in the 2D combat arena, and may not overlap. There is limited space in the combat arena. In the single-player campaign, it's possible that there are more ships in a fleet than fit into the arena. These extra ships get placed in the reserve. Ships in the reserve don't take up arena space and don't participate in combat. In practice, they are somewhere nearby, hovering at the ready. When laying out city defences or preparing for a fight, you can shift ships in and out of the reserve, placing them wherever there's space. During combat, ships can be moved into the reserve if they're at the edge of the arena on your side. So if you're invading a city, your ships come in from the left, and you can move an individual ship to the left edge of the fight and make it disappear into the reserve. You can also shift ships from the reserve into active combat, and they will appear at the far edge of the arena. Note there's a bit of a delay to this, so you can't do weird stuff with rapidly shifting ships in and out. And you can't move your last ship into the reserve! That's called fleeing, and there's a button for that. When a fleet arrives in a new location, the game does its best to move as many ships into active service, leaving the reserve empty. Still, when preparing for a fight, make sure you've got the right ships in active service. If the reserve contains ships, it'll automatically pop out to let you change things as needed.